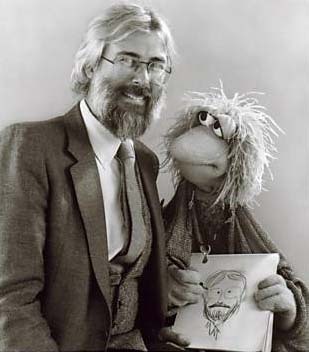 Born July 8, 1941 in Bermuda, Michael Kingsbury Frith is best known for being a co-creator of the hit children’s series ‘Fraggle Rock’. He was born and raised on Salt Kettle and started his media career in Bermuda, working for both ZBM and the “Mid-Ocean News” as a teenager. From a very talented family, he is the uncle of singers Heather Nova and Mishka. Mr. Frith began his career at Random House in 1963 as a children’s book illustrator and editor. He was Editor-in-Chief of the Beginner Books series, the line of books created by Theodor Seuss Geisel, better known as Dr. Seuss. He was also Dr. Seuss’s book editor and close personal friend. In 1971, when Random House began publishing Sesame Street books, Mr Frith was named editor and art director of the Sesame series. He produced a series of five annual large-format Sesame Street Storybooks, and contributed artwork for four of them: The Sesame Street Storybook (1971), The Sesame Street 1, 2, 3 Storybook (1973), The Sesame Street ABC Storybook (1974), and Big Bird’s Busy Book (1975). Appreciating Mr Frith’s talents as a designer, Jim Henson brought him on board his creative team. He joined Henson Associates full-time as Art Director in 1975. He was named Vice President in 1978, and Executive Vice President and Director of Creative Services in 1985. After the success of “The Muppet Show” series Mr Henson wanted Mr Frith, along with a few others to create a new childrens show which would appeal to a much wider international audience. “Fraggle Rock” is the new show which emerged and subsequently ran for 4 seasons – 96 episodes from 1983 to 1987. This new show centered around “Muppet” creatures known as Fraggles, who live underground along with several other species of creature such as Doozers and Gorgs. Mr Frith played a significant part in designing the many creatures and settings which existed in this universe. He has said that Bermuda’s Crystal Caves served as inspiration for the underground world the Fraggles lived in. “On some level, Bermuda influences everything I do,” Mr. Frith said in a 2001 interview. “I think there are places you find yourself in which for no reason you can explain have a kind of presence. I think Venice is like that. New York is like that. And I’ve always felt Bermuda is one of those places. It saddens me to see so much of it paved over. And I sometimes worry that one of my favourite things about Bermuda — the absolutely endemic sense of humour — is being leached away. “But there is something wonderful about this place and its people and I can’t imagine anywhere else on earth that has it. It’s indefinable but it’s definitely present,” said Mr Frith. In October 1995, Mr Frith left Henson Productions to start a new company, Sirius Thinking Ltd., with John Sculley, Christopher Cerf and Norman Stiles. Sirius created Between the Lions, an award-winning educational puppet show on PBS, in 2000.